“It is high time the international community realise that Sudan is the real problem and it is time to put strong pressure although the government is obsessed with sanctions. There is actually a need to put powerful and effective sanctions. The African Union should take [the] lead”, said Luka Biong, a senior South Sudanese official. But according to Pagan, the Sudan and South Sudan could not reach an agreement on their oil relationship. South Sudan was willing to pay a transit fee of $0.69 per barrel to use Sudan’s oil pipelines. Despite the generous sum compared to other international oil agreements, Sudan disagreed, demanding a sum of $36.00 per barrel. Meanwhile, almost five million people in South Sudan, more than half of the population, face increasingly severe food shortages after their government ceased oil exports in a row with the country’s neighbour, Sudan. On a bed of sticks in one of the many straw huts in Yida, Younam, a 14-year-old boy, told the story of how his family fled bombings of their village. When his family and other refugees reached Jau, a town on the border with South Sudan, Bashir’s soldiers attacked. Hiding under a tree, Younam witnessed the rampage. “They cut the babies; then the young people,” the boy recalled. “Then they stoned my parents until they died.” Days later, Younam arrived at Yida—naked, hungry, and scared. “I’m worried there is no one who will ever be able to love me like my parents did,” he said, rubbing his eyes to hold back tears. Adding to the desperate situation, the U.N.’s refugee agency has refused to recognize Yida as a formal refugee camp, setting up two smaller rival camps to the south. Refugees say the other camps are built on swampy, treeless land and that they are unsuitable for living. Refugees, meanwhile, keep pouring into Yida. It is overwhelming to bear witness to these heart-breaking atrocities and to maintain compassionate responses but let us try to absorb the essence of Ubuntu and realize that what dehumanizes others inexorably dehumanizes us. As an external observer, it is important to be emotionally present and self-aware to be able to find appropriate ways to help those in need. “I was running from the sound of the Antonov (aeroplane), carrying my baby, when the bombs dropped and cut my leg,” a civilian, Juad, said. Sudanese armed forces are continuing to bomb the Nuba Mountains area in response to the rebels fighting them. 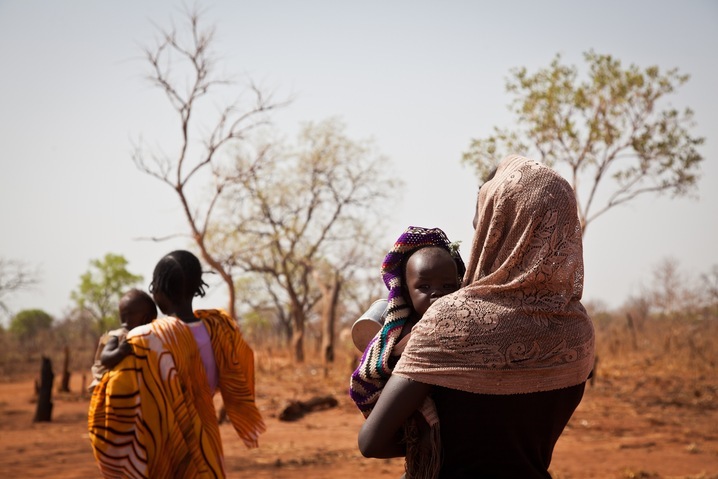 Sudan has used hunger as a weapon of war, driving people from their farms. “There is no food, this is what we eat,” Juad said, displaying a tin bowl of chopped leaves and dry seeds. “Since the war started, the people have been terrified, living in caves. There’s no way to grow anything or graze our cows… nothing is here,” said Ahmed Tia, a local commissioner of Buram county, sitting on a leather office chair under a tree. The region is too volatile for the international community to supply aid, so no food is coming into the area that way either. Hundreds of refugees per day are embarking on the three- to seven-day journey to get to refugee camps on the other side of the border in South Sudan.The rainy season begins in a few weeks and will last until October, effectively trapping them without any supplies. The same exact situation is unfolding in Blue Nile state. More than 200,000 people are in dire need and elderly and children are already starting to die. Many people live in caves in the hills to avoid aerial bombing, which happens day and night. They’ve forged alliances with other rebel groups, including rebels from Darfur, the Nuba Mountains and the Blue Nile with the goal of representing a united presence of resistance from the eastern to the western border, Tristan McConnell, GlobalPost’s correspondent said. Malawi’s new President Joyce Banda has said she does not want Sudan’s President Omar al-Bashir, accused of war crimes, to attend a summit in July. Despite the pressure, Sudan is continuing its aerial bombing campaigns on innocent civilians. How do we attempt to provide some hope and security to a place that is desperately unsafe? Unity state has borne the brunt of aerial bombings by Sudan even after South Sudan had said it would withdraw from Heglig. On Monday, Sudanese warplanes bombed a market and an oil field in South Sudan, killing at least two people, after Sudanese ground forces reportedly crossed into South Sudan with tanks and artillery. There are numerous bombings taking place, just Wednesday, Sudan also bombed the village of Chotchara. Since fighting broke out in Blue Nile state in Sudan between government forces and rebels from the Sudan People’s Liberation Movement-North, about 85,000 people have fled into South Sudan’s Upper Nile state. The states of Blue Nile and Southern Kordofan, where violence began last year, lie north of the border with South Sudan, and have populations who were aligned with the southern Sudan People’s Liberation Movement/Army (SPLM/A) during Sudan’s long civil war. Antonovs planes that bombed the refugees’ villages in Blue Nile have flown over Jamam camp, about 75km west of the border with Sudan, three times in the past week. Already the camp is barely coping with lack of water supplies with so many new people and now there are fears that more may arrive as conflict spreads. There is also the prospect of cholera breaking out as people drink dirty water to survive the dead heat. Time is running out! The United States, spearheaded by Susan Rice said on Thursday it has drafted a U.N. Security Council resolution aimed at making legally binding an African Union demand that Sudan and South Sudan stop border clashes, resume talks and resolve their many disputes. As much as proposals and resolutions create sound progress and policies, the change must be implemented on the ground because time is running out. Sudan needs to immediately halt aerial bombings of innocent people and we need to provide assistance to those who are suffering and on the brink of death.